Generally, the experience at the Marriott in Houston Intercontinental Airport was good. The facilities were clean, and well-managed. Being an airport hotel, getting to the hotel had its own difficulties. However, the staff was courteous and responsive to my needs. I recommend the hotel. This hotel was very nice. The staff was friendly and helpful and the rooms were clean and had everything we needed. old ugly hotel directly in Houston airport.. great location uninspired rooms.. 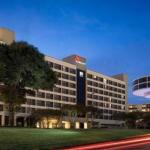 The Houston Airport Marriott, a 559-room well-equipped executive hotel is an oasis within the busy airport complex. An underground tram which operates one floor below the terminals baggage claims gives direct access to the seven-story property. Fine dining includes a revolving rooftop restaurant which overlooks the airport and Houston skyline. There are two ballrooms and 39 meeting rooms to accommodate various sized conferences and meetings. Nearby attractions include the NASA Johnson Space Center, Minute Maid Park, Galleria Shopping Mall, George R. Brown Convention Center and the downtown theater district. All rooms are air-conditioned and have a work desk with Internet access, coffee and tea making facilities, hairdryer, iron and ironing board, dual line phones with voicemail, cable TV with movie channels and pay-per-view movies. Bathrooms have new curved shower curtain rails and shower head package. Dining options include CKs revolving restaurant, a steakhouse open for dinner, Allie's American Grille open for breakfast, lunch and dinner and the Daily Grind, a coffee shop open for breakfast. Room service is available from 6am until midnight. There is a full-service business center, outdoor swimming pool, gift shop, newsstand and ATM. The hotel has laundry and dry cleaning facilities and the 24-hour front desk has safe deposit boxes. The convenience of being within the airport complex is the plus factor for many of those who have stayed here. Many clients are those stranded by cancelled or delayed flights. As a result many are not in good humor when they check-in. The front office staff gets lots of compliments for handling these difficult situations with great tact. Those who use the hotel frequently say it is an expensive place to say but the facilities and location warrant the high price.